[AMSTERDAM - PHARMACOPOEIA]. [TULP, Nicolaes and Pieter BERNAGIE (translator)]. Amsterdam, Jan ten Hoorn, 1686. 12mo. 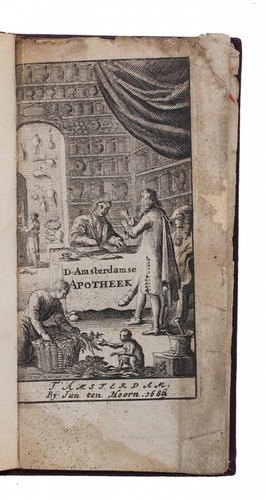 With an engraved title-page by Jan Luyken, showing the interior of an apothecary. Modern red cloth. 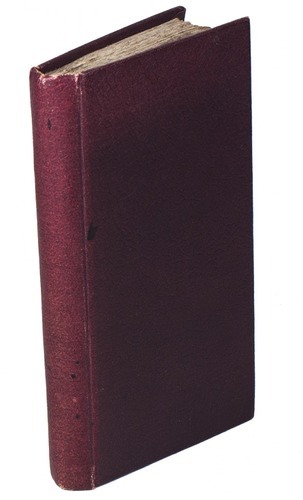 Rare third edition of a Dutch translation of the Amsterdam Pharmacopoeia. Unlike the original Latin edition the Dutch translation not only lists ingredients, but also provides recipes to prepare the medicines. The numbers for quantities, as the publisher notes in the foreword, are spelled out to avoid any (fatal) problems arising from typesetting errors. The final page gives a list of medical titles printed and sold by the publisher. 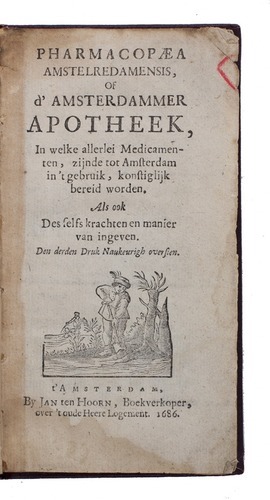 The original Latin Pharmacopoeia Amstelredamensis, the first Dutch pharmacopoeia, with recipes for nearly 200 medicines, was compiled anonymously by Nicolaes Tulp (1593-1674) by order of the city of Amsterdam, to serve as an official legal standard for the correct preparation of numerous medicines. Several cities in the southern Low Countries and Germany, and even London, had produced pharmacopoeias before any Dutch city and Tulp based his on those published in Augsburg, Cologne and London, primarily on the 1622 edition of the Pharmacopoea Augustana (providing about 85% of the content), with some material from the 1627 Dispensatorium Coloniense and the 1627 edition of the Pharmacopoea Londinensis. With the engraving and first three pages damaged and strengthened; a large water stain in the lower margin of the first 14 pages and small holes in several pages (no loss of text). Fair copy of a rare Dutch pharmacopoeia. Daems & Vandewiele, p. 58 (1 copy); Klaversma & Hannema 1176; STCN (same copy as Daems, lacking frontispiece); WorldCat (3 copies).